Krysten’s black and gold dress included a surprisingly effective illusion neckline. Jennifer Connelly, Emma Watson and Emmy Rossum were just a few who earned spots on this week's Top 10 list. The actress made her mark on blue carpet thanks to this black and yellow animal print sleeveless dress. Naomi Watts, Kate Bosworth and Olivia Wilde also top this week's list. Krysten made a real impact in a structured black embellished top. As if that wasn’t chic enough, underneath her trench was a red tweed Peter Som Resort 2013 dress. Also in celeb twitpics this week, Bar Refaeli takes a dive, Brittany Snow attends the J. Mendel show, Brooklyn Decker becomes a brunette, and more. Shop our selection of celeb and runway-inspired pieces that make matching navy and black as easy as it is chic. It was a stellar week on the red carpet from stars like Jessica Biel and Lucy Liu. See who else made our Top 10 list. 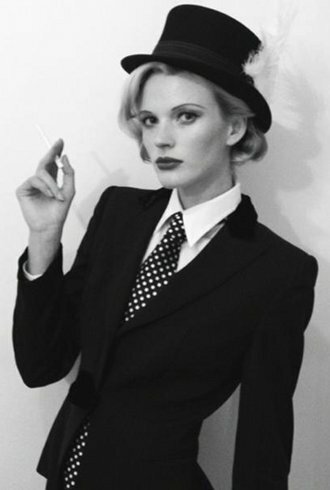 This week in celeb twitpics, Anne V becomes a 20s gangster, Ivanka Trump celebrates Mother’s Day in bed, Ashley Madekwe’s arm candy, and more. There was just something so retro and polished about Krysten’s Late Show look. Scarlett Johansson, Coco Rocha, and Brooklyn Decker also top this week's list. Krysten artfully paired a graphic Jenni Kayne dress with colorful accessories. This week, the star-studded world of Twitter revealed Krysten Ritter’s favorite dress she’s ever worn, Jessie J’s “ice flipper” and Solange Knowles doing her best Titanic pose. Stars showed off great summer looks, ways to cover a baby bump, and super svelte figures. Here are our favorite looks from this week.